Our mission at Tutorialzine is to keep you up to date with the latest and coolest trends in web development. That’s why every month we release a handpicked collection of some of the best resources that we’ve stumbled upon and deemed worthy of your attention. Leaflet is one of the most popular open-source solutions for creating interactive maps. It offers everything you'd expect out of a map library - markers, layers, zooming, and many more basic and advanced features. The project recently got it's official 1.0 release with many improvements to the API, accessibility and performance. Flexbox grid system for React that allows developers to quickly build page layouts using a simple API of 3 React components - Grid, Flex, and Box. Since it utilizes the flexbox model, all grids with Reflexbox are responsive and can be easily adjusted via the various flexbox properties. A UI toolkit for React Native that combines a number of useful components into one package. It includes elements such as menus, various buttons, and form inputs, with new components coming in the future. Very well documented and easy to implement. Awesome library for creating responsive animated progress bars. ProgressBar.js provides a number of built in shapes, and also allows developers to create their own paths using SVG. The progress bars can be further customized through a rich JS options object. Sass mixins for loading indicators with fluid CSS-only animations. The spinners are extremely easy to implement as they require just one HTML element per spinner. To customize the mixins themselves you can simply change the provided SCSS variables. Pretty theme for documents that have been generated from HTML or Markdown. It styles all elements on the page, providing them with proper typography, colors and paddings, greatly improving readability. Implementing the theme is as easy as adding a single class to the root element. Customization is done through Sass. This is a library for easier handling of complex CSS animations. Choreographer makes more manageable the transition of multiple properties at once, animations that start off after different delays, and syncing with user gestures such as scrolling. 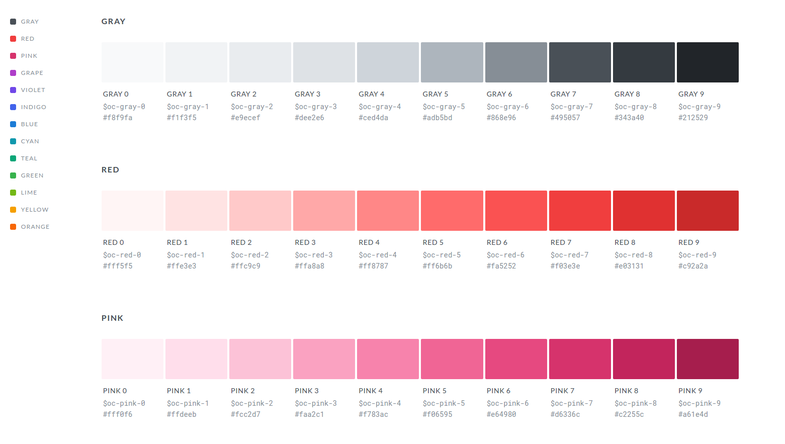 Color pallette created especially for designing user interfaces. It contains 12 colors, each having 10 variations with different intensity. Open color is available in CSS, Sass, Less, and as a plug-in for Photoshop, Illustrator, and Sketch. Ionicons is the icon font from the Ionic framework, but it can be freely used as a standalone library. The collection consists of over 500 premium-quality symbols and logos, all drawn in a modern and very appealing style. One of our favorite icon fonts at the moment. Awesome! Glad I found this site. Thanks for sharing! Thanks a lot for giving the latest goodies for web development. Appreciate it! Try viewScroller.js plugin for creating fullpage scrolling websites. Wonderful, thanks for the time you spend on this.